Passionfruit is a round or oval shaped tropical fruit with a yellow or purple brown skin. The pulp contains seeds which are also edible. 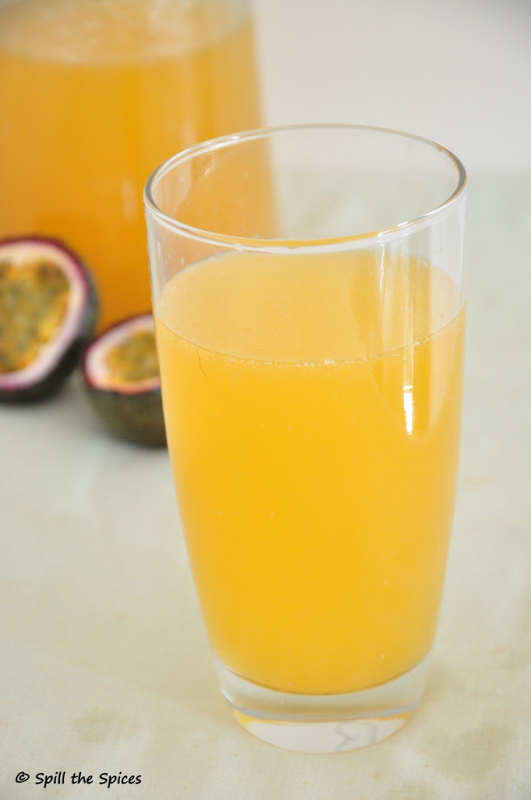 Usually passionfruit juice is added to other fruit juices to enhance the flavor. Apart from its sweet taste and flavor, passionfruit has several health benefits. The juice of passionfruit is a good source of dietary fiber, anti-oxidants, vitamins like A and C and an excellent digestive stimulant. It is also good for patients with asthma. I love the sweet and slightly tangy flavor of the passion fruit and had been thinking long time to make a drink with it. So when The Groovy Gourmets had to make a non-diary drink from Food Gawker, I picked up this passionfruit spritzer. Usually a spritzer is made of wine and club soda or sparkling water. 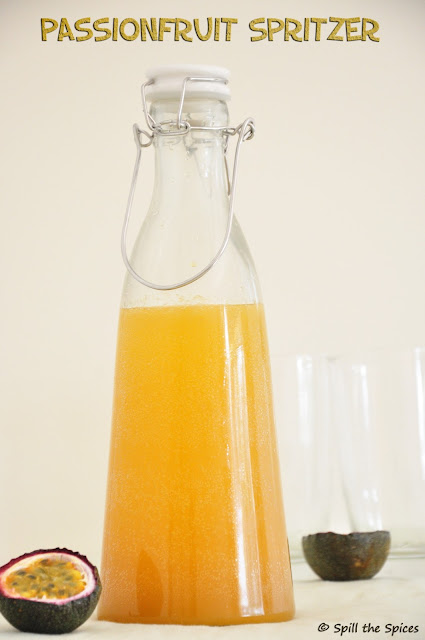 Juice spritzers are non-alcoholic, with fruit juice or flavored soda replacing wine. Instead of club soda, you can use lemon-lime soda to give more tangy flavor to the spritzer. 1. Combine sugar and water in a saucepan over medium heat. Heat just until the sugar dissolves completely. Allow the sugar syrup to cool. 2. To the sugar syrup, add passionfruit juice, soda and mix well. Top with ice cubes and serve. 1. 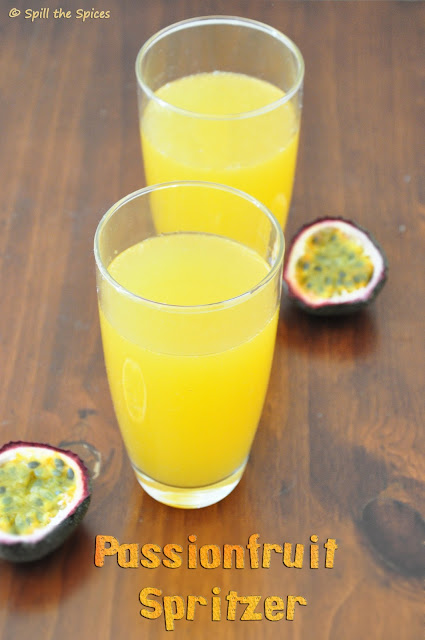 You can use fresh passionfruit or canned passionfruit pulp to make the passion fruit juice. 2. To make the juice, scoop the pulp into a sieve and push the pulp with a spoon to release the juice. 3. Canned passionfruit pulp may be already sweetened, so adjust sugar accordingly. Lovely clicks and love this pretty fruit. The drink looks cool ...very refreshing. wow liked all your clicks sona.. delicious preparation..
lovely drink n yumm fruit bful click..
That's an amazing looking passion fruit spritzer.. love those wonderful clicks ! Refreshing drink and beautiful clicks, esp. the last one - loved it! Refreshing drink and nice clicks.